We are told that the Verne detention centre will be closed at the end of 2017. But is it really closing in the minds of those who were detained there? 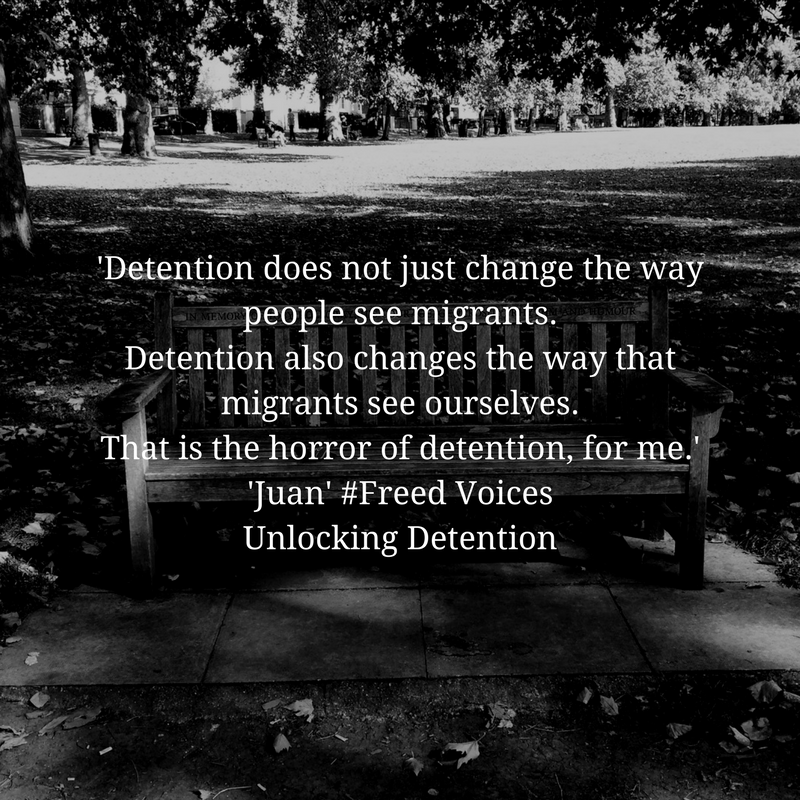 ‘Juan’ from Freed Voices responds to this news with this poem. By Juan, from Freed Voices. Last week I had an appointment with my therapist. I see them for PTSD. I have trauma from my time in the Verne. As I left my therapy, I searched for the address of where I had to go for a volunteer interview but I soon realised I had lost it. I went home to get it and on my way, I passed through a park. I was stopped by a police officer. He asked me if I smoked or sold drugs. He asked why I was here at this time. I explained I was coming from my therapist. He asked for my status. I explained my case was ongoing. He said he needed to search me and took my I.D. I said I wanted to call my solicitor. He said there was no need. He made a quick telephone call and then he said that we would need to go to the police station. He said the Home Office would come and see me there. In that moment, I felt an extreme panic. For a second, I thought I would die there and than in the park. All I could think about was the Verne. I have been to the Verne twice before. Altogether, I was detained there for three months. All I knew was that I would have preferred to die in that park then go back . The officer put me in handcuffs like a criminal. Even now my wrists are burning. They took me to the police station. They did not let me call my solicitor. They took a police photo of me and my fingerprints. They put me in a small cell with a bright, UV-light. After two hours, an immigration officer came in. He made the room feel very cold. He said I had not complied. I explained my medical situation. He said he needed to speak to his superior. One – I would be released. Two – I would be taken back to detention. Just thinking about the Verne makes me think of death. So many people have died inside detention – 31 now. The Verne is a cemetery for hope. I don’t see how I would survive a fourth time in detention. You are cut off from the rest of the world there. You are waiting to die. When the immigration officer said detention, my heart started beating very, very fast. My legs started to feel very weak. I felt like an old cancer had returned to my body after a period of remission. I was in this kind of state for the next two hours before they released me. I went to a friend’s house that night. He hugged me the whole night I was so scared, I could not stop shaking. I did not want to go out on to the street again. I am pleased to hear that the Verne is closing. But for those of us that have already experienced it, it will always be open. This is the real meaning of indefinite detention. Detention is a demon that stays with you forever. I am a man and I don’t know how it is to walk alone as a women in the street but I have many female friends and when they explain their fear, it sometimes feels familiar to me. When you have experienced detention, you walk every day with the experience on your back. It is a trauma that follows you everywhere. You are always looking behind you. I think a part of me died in detention. I am different person now. The abuse in that factory changed me – I have a different identity. Detention does not just change the way people see migrants. Detention also changes the way that migrants see ourselves. That is the horror of detention, for me. I am finding strength in the community of people around me and the other members of Freed Voices. These kind of triggers release a lot of emotions and they are a family that can share and absorb them. They are helping me find my feet again. All we can do is speak out – about the pain, and the cruelty, and the alternatives.